Gardenia is one of the most popular scents when it comes to candles, perfumes, and aromatherapy. The light floral scent makes it an ideal natural scent instead of the sometimes overwhelming perfumes created by chemicals. The uses of gardenia essential oil are so impressive it has been used in alternative medicine for centuries. This beautiful white flower is not only cultivated for its large blooms but also to harvest the multiple benefits of gardenia essential oil. Not only pleasant in scent, but gardenia has been found to affect the metabolism of the body. People were found to have reduced insulin resistance, one of the effects of diabetes and metabolic disorders. And when paired with exercise, this essential oil was found to help the body process sugar and even reduced some body fat. (1) It was also found to have substances that protected kidneys, which is usually damaged by high blood sugar. (2) This oil has the potential to help in controlling blood sugar, controlling diabetes and with losing weight as well. In a world where antibiotic use is creating resistant bacteria, natural oils may be the answer to treating many common bacterial and fungal infections. Like many essential oils, gardenia essential oil has antiseptic, antifungal, and antibacterial properties. It has been found to reduce h. pylori in the stomach, a bacteria which eats away at the lining of the stomach. It has also been used topically to fight fungal infection like athlete’s foot. (7) It can also be used in conjunction with other oils such as lavender and peppermint to kill bacteria and viruses on surfaces in the office or home. (8) Gardenia essential oil is also mild enough to be used topically on wounds and has the double effect of helping to reduce inflammation around the area as well as kill microbes to prevent infections. Whether your aches are from just every work we put our bodies through or something more serious such as arthritis, gardenia essential oil may allow you some relief from the aches and pains. When applied on skin, the oil has anti-inflammatory properties, easing the redness, swelling, and pain that is our body’s response to an injury. (9) It also has some relaxing properties, especially when used in aromatherapy for its pleasing scent that can help with pain due to tension. It can help relax the body enough to allow a more natural healing to occur. (10) Use 5-10 drop in a warm bath to relax tense, painful muscles. Adding a half cup of salt will act as an emulsifier to help spread the oil. New research is finding that more people are suffering from a degenerative disease that affects the mind and memory in particular. This includes diseases such as Alzheimer’s or Parkinson’s where the mind begins a slow decline. This may be due to an inflammation of the neurons due to years of a poor diet and the decreasing ability of brain cells to process glucose as they age. Gardenia has anti-inflammatory properties when applied topically or taken internally. The inflammation interferes with the neuron’s ability to properly process neurochemicals in the brain. (11) This property of gardenia essential oil would allow neurons to produce and take in the necessary chemicals to promote memory and protect the tissue from degenerating further. (12) Drinking gardenia tea or consuming gardenia fruit may be one of the ways to get the most of this benefit. I don’t know if it’s just me or if everyone finds themselves covered in bruises at the end of the day and aren’t quite sure where they come from. I tend to lift heavy things without thinking, which of course reminds me later in the day that I’m not nearly that young anymore. Running causes me a bit of pain, especially in the knees and ankles. Even the yoga I do to stretch out those muscles comes with its own twinges and pulls. Taking care of my health and then finding the energy to run around after kids take its toll on my body. This leaves me aching by the end of the day, and I’m ready to sit and relax, and maybe ease some of the pain. I try to avoid over the counter analgesics unless my essential oils just can’t touch whatever is causing the pain. I find that this doesn’t happen often…and it smells heavenly! I love to mix gardenia essential oil in a bath along with some lavender oil. I recommend trying this at bedtime since both lavender and gardenia essential oil have relaxing properties that can be useful for helping you get to sleep. Of course, the bathroom smells like a garden when the oils start letting off their relaxing scents. Warm water, a cup of Epsom salts and about 10 drops each of lavender and gardenia essential oil and you’ve got a recipe for not only reducing all those inflamed muscles but for becoming relaxed enough to fall asleep there in the bath. I’ve also taken a washcloth soaked in the bath water and placed it over my eyes for another of the benefits of gardenia essential oil. Between the gardenia and lavender, my entire body feels like I’ve had a great massage and I can go to bed ready for another day. Perfume is only one of the uses of gardenia essential oil, and you may want to trade it in for a purer smell, without the irritation of alcohol and other chemicals that may interfere with the unfiltered scent of pure gardenia. This concentration is perfect to use 5-10 drops in a diffuser around your home, so you can enjoy the relaxing aroma and reap the anti-microbial benefits of gardenia, killing many of the germs hanging around your house. 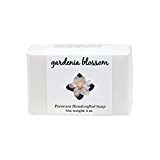 Gardenia is generally mild and can be applied directly to skin so the next time you cut yourself, a little of this may keep infection at bay. Using gardenia essential oil as you bathe has many benefits, beyond leaving behind a pleasant floral smell. If you don’t want to add the oil to your bathwater, this soap bar may be your next best choice. This particular soap incorporates natural oils instead of chemicals as well as cocoa butter to leave skin smooth and moisturized. Using this bar on your entire body will give you the germ-killing properties that make gardenia essential oil so valuable to the medical community but not leave your skin overly dry like other anti-bacterial chemicals. The list of ingredients is pretty straightforward and mostly natural oils to help keep you clean, germ-free, and smelling good. Unlike other perfumes that sometimes have an overwhelming smell or chemical fillers, this is an oil with gardenia and citrus in coconut as a carrier oil. Gardenia and citrus have cleansing properties, being antimicrobial and antibacterial, as well as stimulating the mind. Citrus is a great compliment to the anti-inflammatory effects of the gardenia, stimulating the mind while the gardenia helps the cells become less inflamed and able to process neurochemicals more effectively. Citrus can also help protect from bacteria that can be found in the air. This oil is packaged with a rollerball for easy application to any part of the body desired. Gardenia may lower blood pressure so you should consult a doctor if already taking medication for hypertension. Gardenia is a class 1 substance meaning it can be taken internally but it is recommended not to exceed 12 grams per day. Since gardenia can be used to lower blood sugar, people with diabetes should monitor blood sugar level closely. Gardenia essential oil may increase the drowsy side effects of some drugs. Do not drive or operate machinery until you know how it will affect you. Use with a carrier oil to prevent any skin irritation or test a patch of skin first to see if you have a reaction to gardenia essential oil. Gardenia essential oil is not recommended for use with pregnant or breastfeeding women or children under 18. I hope you found the uses for gardenia essential oil as helpful as I do. In a world full of increasingly resistant bacteria, finding natural means to fight germs and perhaps prevent memory issues later in life are fantastic benefits to find in one oil. Remember to share with your friends so they can enjoy the pleasant scent and medicinal uses of gardenia essential oil for themselves.